Philadelphia, the birthplace of America, is the final resting place of some of the nation's greatest citizens. The burial grounds of Christ Church hold the remains of Benjamin Franklin and six other signers of the Declaration of Independence. Philadelphia pioneered the development of the rural cemetery with the establishment of Laurel Hill, eternal home to Gettysburg hero George Gordon Meade and thirty-nine other Civil War-era generals. In Philadelphia's Jewish, Catholic, and African American burial grounds rest such notable figures as Rebecca Gratz, model for the Jewish heroine of Walter Scott's Ivanhoe; John Barry, Catholic father of the U.S. Navy; and Octavius Catto, an African American civil-rights leader of the nineteenth century. Finally, there are the vanished cemeteries, such as Monument, Lafayette, and Franklin. Transformed into playgrounds and parking lots, these cemeteries were obliterated with sometimes horrific callousness. Philadelphia Graveyards and Cemeteries tells the intriguing history of these burial grounds, whether revered or long forgotten. 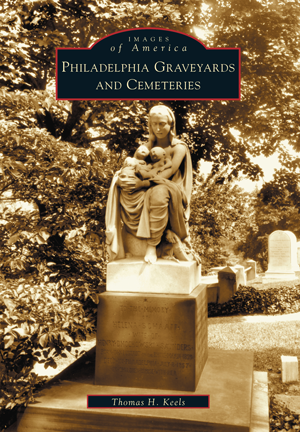 Thomas H. Keels is a Philadelphia writer, historian, and cemetery tour guide. His first book, Chestnut Hill, was published by Arcadia in 2002.